Fatherly Advice: At what age did you take your kids hunting? Ok. So the question in the topic may be irrelevant to my actual situation, but I still want to hear your answers! My daughter is nearly 2 1/2. She loves the outdoors, is a handful and a spitfire, and loves the dogs and her dad. I'm wanting to chase some pheasant this weekend, but I also don't want to leave my 8 months pregnant wife to chase down an active toddler all weekend (I work Saturdays). So that being said, here is MY PLAN: I would like to go for some short walks with her on my back in a "baby bjorn" type pack. She would wear blaze orange, have sufficient ear protection, and plenty of warm clothes. In easy cover I will let her down and walk some (but likely not for long despite the fact that she's a trooper). Before going out I'm going to first test my vest with the pack to be sure I can get birds into the bag. Also, I'm going to see how she does with gun shots. Much like gun breaking a dog I'll start some distance away while she's distracted, moving closer and with ear protection. Thoughts on my plan? Criticisms? Anyone have experience with a kiddo this young on a hunt? Or know of anyone else's experience? In all honesty, she may be terrified of the gun shots and then I'm not sure what I'll do, but I'm hoping she can come along. She loves the dogs, loves the outdoors, and definitely likes to see the birds I bring home each weekend. Re: Fatherly Advice: At what age did you take your kids hunting? My advice as someone who raised three hunters... if she goes with you at that age it is about her not the hunt. Just like with a pup when she gets tired you are done. Also, for my kids (youngest being a girl) at first it was just as much about doing the guy stuff. If you can find a buddy with a kid go for breakfast kids love sitting watching the guys give each other hard times about past hunts plus hot chocolate and a donut starts the day off right. As kids get older it is fun to carry a B.B. gun and gives you a great opportunity to watch and discuss gun safety. When older and you kid really wants to go with the guys the way I handled that was being frank and letting know this would be a different hunt. The group would be deciding things and no whining. If they weren’t good with that they could not go. My Dad took me fishing around 3. When I could walk farther he took me hunting - around 7. When I could hold a .22 I did - around - 12. ( No rules back then.) If I could hold the gun safely - no muck in the barrel- I got to shoot it. Wonderful heritage for all the kids . My big brother hunted all his life and my little brother is a hunting guide in BC. My dad took me bird hunting with him starting when I was 8-9, No gun, just walking with him, my uncle and the dogs. Started hunting with a shotgun when I was 10, but mostly I was the designated flusher. Fast forward about 30 years and I started taking walks with my son and the dog when he was about 3-4. When he got tired, I put him on my shoulders and he got to ride the rest of the way. By the time he was 8 or 9, he no longer needed the shoulder ride. He also got his shotgun about 9-10 and started hunting when he was 10. By the time he was 12 he could walk pretty much with me, wherever. Now he can flat out bury the old man, and that's OK.
My grandson is 8 and, to date, has shown no real interest in bird hunting. He likes the dogs and has gone out training with me a couple of times, but he is not fired up about the prospect, so I basically have let it be and so has my son. He has gone out with him with a BB gun a couple of times and he "sort of" enjoyed it, but again, wasn't particularly fire up about it. We shall see. Reckon if the preparation and training is done , ..then it will be fine come the day . polmaise wrote: Reckon if the preparation and training is done , ..then it will be fine come the day . What a great scene! A young boy, in what is obviously perfectly proper attire, sending his dog. Awesome! Thank you so very much for sharing that. 21/2 might be a little young, but I would go on test hunt with her and dress her up and try shooting around her. Also remember when she is done so are you. I took my kids out for the first time when they were in grade school. They need to be big enough to walk a bit without being tired or you'll make them resent it. My daughter is my oldest and she's turning 11 tomorrow. Last year was really the first time I started taking her with me. 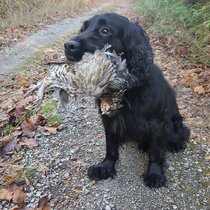 Only very short grouse hunts where I'm mostly focused on her and not the birds and still hunting either waterfowl or deer. Much easier to entertain in a blind or stand than expecting her to walk countless miles. So far it's working as she absolutely loves going with me. I have hunted all my life and probably was out younger than her but I still remember to this day going with my dad and although I wanted to go I can remember times where I didn't enjoy myself because I was tired and had a hard time keeping up. You've got their whole life ahead of them. Just like training a new pup there's no need to rush it. You can do more harm than good. From a father of 4, incl. 3 girls, 2 1/2 is too young, especially if you are going to do any shooting. If I need to explain why shooting firearms around a baby is a bad idea, well, I won't bother. I would never take a baby, and that's what she is, hunting. If I ever went on a hunt where some bozo brings his baby into the field I'm leaving that scene as fast as I can and will never hunt with that person again, as that shows some pretty poor judgment. Leave your baby at home or better yet, stick by your 8 mo. prego wife and help her out with the baby. porochi wrote: From a father of 4, incl. 3 girls, 2 1/2 is too young, especially if you are going to do any shooting. If I need to explain why shooting firearms around a baby is a bad idea, well, I won't bother. I would never take a baby, and that's what she is, hunting. If I ever went on a hunt where some bozo brings his baby into the field I'm leaving that scene as fast as I can and will never hunt with that person again, as that shows some pretty poor judgment. Leave your baby at home or better yet, stick by your 8 mo. prego wife and help her out with the baby. Well hold on, saying you shouldn't have to explain something as a reason for not explaining is a poor way to communicate. So why wouldn't you, personally? Why does it show poor judgement? What exactly makes it a bad idea? I'm posting this to hear the reasoning so I'm genuinely interested in just that... the reasoning. Baby is not the word I would use to describe her. Honestly, she's an extremely capable toddler. I'm not sure if you are familiar with Gooseberry Falls State Park along the North Shore in Minnesota, but she hiked from the parking lot, down to the falls, and along the trails until we reached Superior, earlier this fall. We watched her and if she made any indication that she was tired or needed to be carried we were ready and willing to do so. It was quite impressive. If you're not familiar with the park, Google it. So she's a liiittttllleee more capable than a baby. Keep in mind, in the world of child development, some children are faster than others. On the physical skills side of things, she has developed quickly. This is a toddler who insists on carrying in firewood. I'm not arguing whether she is old enough or not. I came here to hear people's reasoning and thinking. Sooo if you could share your reasoning for your opinion, I would love to use it to inform my decision. mnaj_springer wrote: This is a toddler who insists on carrying in firewood. Alright, since you insist, here goes: I have lots of kids myself (4) so I speak from considerable experience; firearms and tiny children do not mix. Period. When in the field with a loaded gun, that gun, your field of fire, you awareness of same, that's everything you should be focused on. Having a 30 month old strapped to your back when hunting, with a loaded firearm? If that's not a distraction from said firearm and your observational awareness, I don't know what is. Sort of like texting and driving, sure, you can do both, but neither very well. Nor safely. I lost a friend to a hunting accident so safety cannot be emphasized enough for me. I just think anyone who decides to go hunting with a loaded firearm while walking around with a 30 month old child is exercising poor judgment; you're a danger to yourself, that child, and others, because your attention, rightly, is going to be devoted to the baby, especially in an afield environment, but you also have a loaded gun too, and you're hunting, so your attention is split. But both actions deserve your full, undivided attention. And you can't devote your full attention to either. porochi wrote: Alright, since you insist, here goes: I have lots of kids myself (4) so I speak from considerable experience; firearms and tiny children do not mix. Period. When in the field with a loaded gun, that gun, your field of fire, you awareness of same, that's everything you should be focused on. Having a 30 month old strapped to your back when hunting, with a loaded firearm? If that's not a distraction from said firearm and your observational awareness, I don't know what is. Sort of like texting and driving, sure, you can do both, but neither very well. Nor safely. Thank you! Some reasoning involved, some appeal to authority, but thank you! So you've provided the descriptive.... now what is the prescriptive? When you feel safe in the field with all the other hunters carrying a loaded gun and being mentally capable of making the right decisions that may well involve your life or death, you probably made the right decision as far as lull fledged hunting. If the just want to walk along that can be much sooner. Just remember board at an early age is probably the biggest shut down there is. Being made to wait is normally the antipitation booster. ezzy333 wrote: When you feel safe in the field with all the other hunters carrying a loaded gun and being mentally capable of making the right decisions that may well involve your life or death, you probably made the right decision as far as lull fledged hunting. If the just want to walk along that can be much sooner. Just remember board at an early age is probably the biggest shut down there is. Being made to wait is normally the antipitation booster. The anticipation thing makes sense to me. And to update everyone, I didn't end up going out with her. Not because it wasn't a possibility, but rather because my wife was having some cramping. Our daughter came a month early and my wife had experienced similar symptoms, so I stayed home just in case we had another early bird. Congrats !! to come , and good thing you stayed home.If the baby had come, you'd have never been forgiven for going hunting on that day. Sharon wrote: Congrats !! to come , and good thing you stayed home.If the baby had come, you'd have never been forgiven for going hunting on that day. She's feeling better but fingers crossed we can wait another week or so, that way we can stick with our regular doctor for a "full-term" birth.